Your Pierce ancestor from England was Michael, who came over and settled in Boston, Mass. about 1635. He moved to Scituate, Mass., where after four generations, Augustus was born -- the Revolutionary soldier who accompanied General Sullivan on his raid against the Seneca Indians in Western New York. Evidently he liked the land in the "Massachusetts Grant" (the Genesee Valley and the rest of the Seneca lands), for he moved to Rushville, just east of Canandaigua Lake and near Geneva. Here Gardner was born (my grandfather and your great grandfather). Gardner took up a farm from the government at Loon Lake (now in the township of Wayland, Steuben Co., N.Y., formerly in Cohocton township). There my father was born and named Harrison Gardner Pierce. You will find the name of Augustus Pierce in the Pierce genealogy which I gave you, at page 67. I have no picture of my Pierce grandfather. 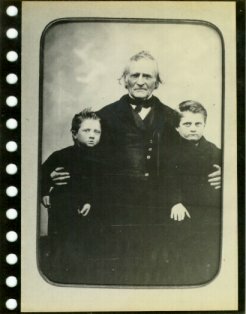 The picture opposite is that of my grandfather Adin Parmenter, with Adin and me. I am the serious boy on your right, and probably about six years old. Adin Parmenter was born in 1789 and died at our home in Wayland in 1875 when I was seven.